Civil War veteran Charles Howard Dickson is buried in Oak Hill Cemetery outside of Quenemo. If given a chance, no doubt Charles could tell you many different stories of the experiences in his life. 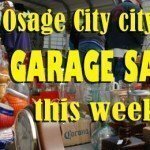 However, the one he’d probably tell you first is the exciting tale of his involvement in the rescue of a man and mark the beginning of what was known as the Wakarusa War in Kansas. Charles’ family moved to Kansas Territory in March 1855 with an immigrant aid company, intent on making Kansas a state free from slavery. The Dicksons settled on a claim in Douglas County, south of Lawrence. While Charles and his father worked on making the claim ready for their homestead, they stayed in a tent on the claim. Charles’ mother and three siblings resided in Lawrence until the homestead was suitable. Charles’ father would be gone occasionally overnight, leaving the 16-year-old Charles to watch the claim. Threatening storms were the only thing that would make young Charles leave his post, when he would take refuge at the neighboring home of James Abbott and his family. It was because of this situation that Charles was one of the few people involved in what was known as the “Branson Rescue” from beginning to end. Jacob Branson was a nearby free-state settler. Branson’s friend, Charles Dow, had been shot in mid-November over a land claim by Franklin Coleman, who was a pro-slavery advocate. Coleman fled to Westport, Missouri, seeking to secure an arrest warrant for Jacob Branson. The reason for the warrant was that Branson sought to kill Coleman for murdering his friend. However, it is more likely that the arrest was to silence Branson, the principal witness for the murder of Dow. Not long after the murder, the local residents attended the Dow murder investigation, James Abbott among the attendees. While the older men were at the investigation, Charles Dickson was a guest at the Abbott home when a knock was heard at the door. A neighbor had arrived, announcing that Sheriff Jones of Westport was on his way with a group of men under cover of darkness to arrest Jacob Branson for the attempted murder of Franklin Coleman. Mr. Abbott and some of the men who had attended the Dow murder investigation arrived at the Abbott home not long after and rushed to the Branson house to intercept the sheriff and his posse. They were unsuccessful and found themselves instead in hot pursuit with an attempt to rescue their friend. The free-state group of about 10 or 11 men eventually met up with the posse and demanded that since Jones could not produce the warrant that he claimed to have, the sheriff release their friend. A long period of threats and “impressive language” was exchanged between the two parties, with the free-state group doubling in number by the end. 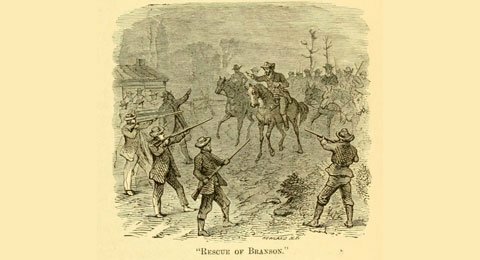 Branson was reluctantly freed, with Sheriff Jones vowing to return to Kansas Territory with a mass of men in retaliation for this act. The free-staters took Jones’ threats seriously and went to work fortifying the free-state community of Lawrence. 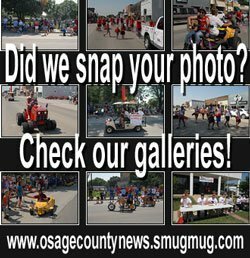 They built blockhouses, breastworks at the street intersections and a fort on Mount Oread. Word was sent to other free-state communities in the territory to assist in the defense of the town. Burlingame sent Captain Henry Todd and Company J of their Free State Guard, which was the first military company organized in the town. Lawrence was well prepared for an attack, except for a lack of ammunition which sent young Charles Dickson secretly back to Mr. Abbott’s homestead to dig up buried munitions. Sheriff Jones arrived from Missouri with more than 700 men, some reports saying that up to 3,000 were camped at pro-slavery towns of Franklin and Lecompton. The free-staters appealed to Governor Wilson Shannon and a temporary peace was arranged, in part due to falling temperatures and the use of a little liquor on the pro-slavery side. This peace was not to last though, the turmoil in the territory during 1856 caused Governor Shannon to claim that governing Kansas in that year was like “trying to govern the Devil in Hell”, so great was the fighting. This was the time called Bleeding Kansas. Before Charles would finish his story to you, he would make sure that you knew that this most bloody and turbulent time in Kansas history was just a pretext to the nation’s civil war, and he was there at the very start. 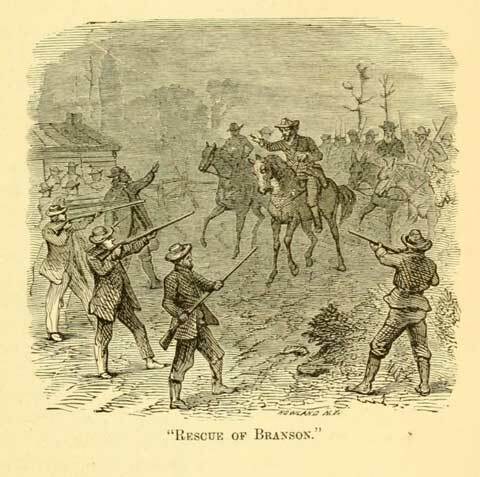 Illustration of the “Rescue of Branson” from History of Kansas by John Holloway, 1868. 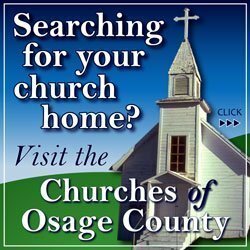 Editor’s note: The Kansas State Historical Society denoted today, Nov. 21, 2018, that it was on this day in 1855 free-stater Charles Dow was shot and killed by pro-slavery Franklin Coleman in a land dispute. This started the Wakarusa War which lasted about two weeks until a treaty was signed on Dec. 8.